My family always says I'm the hardest person to buy gifts for which is ridiculous. A Specs gift card is all I need for happiness... which sounds concerning when you really think about it. Do you have someone in your life that loves beer and the like and you just don't know what to get them? I've got you covered. Below you'll find some gems that anyone that enjoys the pint. This might be the best book out there to start diving deeper into beer. It's great for beginners and experts. Everyone knows how to drink beer, but few know how to really taste it with an understanding of the finer points of brewing, serving, and food pairing. Discover the ingredients and brewing methods that make each variety unique and learn to identify the scents, colors, flavors, and mouthfeel of all the major beer styles. Recommendations for more than 50 types of beer from around the world encourage you to expand your horizons. Uncap the secrets in every bottle of the world’s greatest drink! We're rolling out some limited Lady Baldy glasses for Christmas and when they're gone they're gone. $10 for the set and a something that we would definitely classify as a need and not a want. Growlers are a great tool. You head over to your favorite brewery or growler fill station and fill up with 64 ounces of your favorite brew. The only problem is that once the beer goes into an unpressurized container it starts to go flat and it will only last a few days at most. 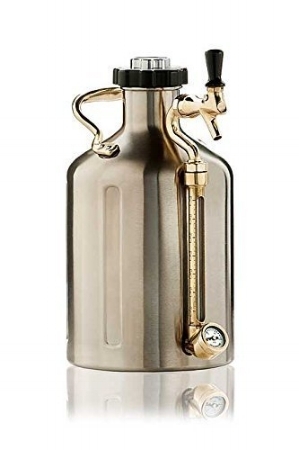 With the Ukeg growler you pressurize it with a CO2 cartridge and you can hold your precious brew for much longer. They're expensive but if you love growlers then it's a must have. You can also save a good amount of money by just getting a standard growler at your favorite fill station. This is the ultimate beer glass. The Teku was designed to accentuate the flavor and aroma of beer to maximize your experience. No glass collection is complete without one. The Best Gift my wife ever got me was going to a great bottle shop and picking out a few bottles of hard to find beers for my collection. If you really love your spouse, buy them beer.